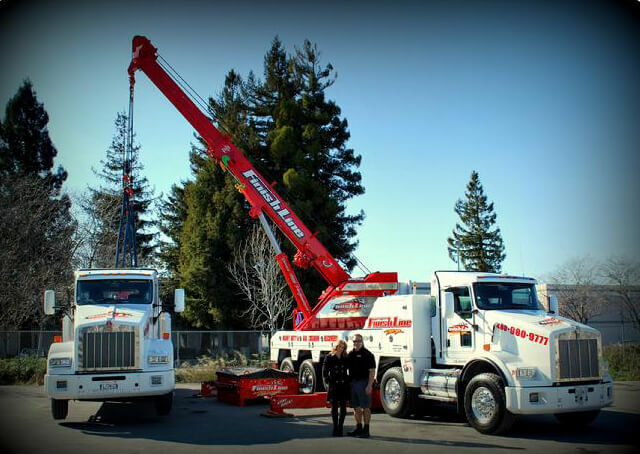 Finish Line Towing, Inc. is a full service towing company, specializing in heavy duty recoveries with terminals in San Jose and Santa Clara, CA. The Tomassi's know what hard work and dedication mean as they both came from a long line of family owned businesses. Bringing their strengths, knowledge, strong foundation of integrity and determination, Dino and Andrea established Finish Line Towing, Inc. in 2000. Today they are second generation towers, and their philosophy is "If we don't take care of our customers, someone else will." Their slogan is "Service with Performance" and that is instilled in each and every employee from their very first day of work. Finish Line Towing, Inc. takes great pride in the way they do business. You can be assured their drivers will arrive in a clean uniform and will provide you with a professional and pleasant experience. "Dino and I both come from separate family business in which our parents instilled in both of us the importance of hard work and dedication. We have brought together our experiences and knowledge and have created a company that gets back to the basics.........SERVICE! These principles truly set us apart from our competition".